246 pages | 18 B/W Illus. Over the last two decades, Singapore has undergone a substantial degree of ‘Asianization’. Apart from participating in the Asian values debate of the 1990s, re-visioning itself as ‘New Asia’ and a global-Asian hub, and establishing Asian identities for the commodities it consumes and produces, Singapore has also repurposed its modernity, cultures, and ethos along similar regionalist precepts. However, even in recent times, Singapore continues to vacillate ambivalently between identifying with and differentiating itself from Asia. Responding to the challenges Singapore faces in coming to terms with its Asian identity, this book examines the complex cultural, social, and political underpinnings that have shaped Singapore’s mainstream discourse on Asia. Indeed, it argues that its legacy as a colonial port city, the exigencies of managing the post-independence nation state, and the larger forces of imperialism and capitalism all contribute to its politics of Asianism. Taking a thoroughly interdisciplinary approach that spans history, cultural studies, postcolonialism, and cultural geography, Leong Yew reveals how Asia has been used to narrate Singapore’s beginnings, revalidate Singaporean ethnic culture and to consolidate its practices of consumption and commodification. This book will be welcomed by students and scholars working across a range of fields, including Asian culture and society, Asian politics, cultural theory and postcolonial studies. In an era when the word ‘challenges’ has all but replaced ‘difficulties’ and ‘crisis’, Singapore could claim to be the pioneer of this Orwellian, linguistic sleight of hand. Every bump on the smooth ride to peace and prosperity was a test to the resilience of the people, and of course, the talent and bold decision-making of the political elite. The book is an innovative, refreshing take on the old but continuing theme. As Singapore finds itself facing the new ‘challenges’ of the rise of India and China, the intake of Asian migrants and the volatile global financial system, she returns to the well-tried blend of authoritarian control and redefinition of national identity. With prodigious subtlety and theoretical panache Leong Yew traces the journey of Asianism in Singapore from the past days to the current flowering into an extravagant, promiscuous politics of otherness. This is well-written book, artfully argued and deserves to be read by anyone who wishes to see the island state as more than a sole province of one man – Lee Kuan Yew. Through the creative use of novel concepts such as ‘franchised orientalism’, Leong Yew’s Asianism and the Politics of Regional Consciousness in Singapore adventurously examines the complex and multiple bases for ‘Asian’ thinking in the city-state. The legacy of British colonial thought and the post-independence attempts by the Singapore state and its agents to formulate a new national identity — an identity that increasingly did not want to be a cultural sign positioned in simple opposition to the ‘West’, but to be an identity that signified a cultural return to Asia — lead to the disjunctive cultural space that is contemporary Singapore. Yet, Yew contends that this space ironically possesses a unitary logic. This book is an ambitious project that will stimulate a larger reflection of (fractured) ‘Asian’ cultural identities in a time when perhaps the fabled ‘Asian century’ is finally arriving. All through its history, Singapore has positioned itself, particularly to the West, as the ideal hub from which to either engage in business and trade or to physically explore the broader Asian region. This narrative has dynamically defined the city-state since its modern, colonial – and indeed pre-colonial – beginnings, resulting in the powerhouse economic status that Singapore now commands on the world stage. The contra-narratives of Singapore’s ‘Asian-ness’, its multiplicity or even its lack thereof, are equally well-circulated, perhaps only in casual conversations or on personal travel blogs, not so much in academic discourse. Is Singapore really an Asian country? How Asian are Singaporeans in their cultural practices and consumption? Is there an underlying Asian consciousness amongst Singaporeans? 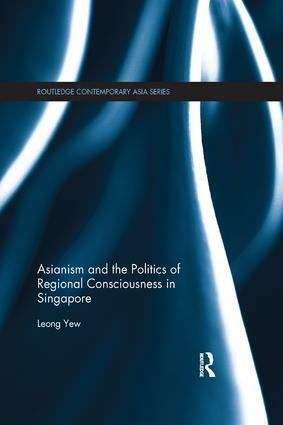 Asianism and the Politics of Regional Consciousness in Singapore by Leong Yew fills this massive scholarly gap with aplomb. This book is arguably the most comprehensive yet that addresses these questions, and seeks to explain how structuring Singapore as Asian is necessarily framed within a broader regional consciousness. Drawing from foundational sociological, anthropological, cultural and political theories, the book deals with the complexities of ‘Singapore Asianism’, understood quite simply as the nation’s mostly successful albeit disjunctured relationship in and with Asia, and vice versa. The book is most engaging not least because it is presented in a systematic and chronological fashion, with the style of writing accessible and therefore likely to appeal to general interested readers. The first part offers an historical perspective of the formation of Singapore, its colonial past, journey towards independence as well as its search for a self-identity and the elusive ‘Asian soul’. The book then looks towards the present (and future) by dealing with Asian ‘capitalist’ discourses of consumption and the commodification of food, cultural practices, knowledges and landscapes. It offers, in conclusion, not so much a resolution of what Singapore Asianism means in Singapore (since it remains always a work-in-progress), rather how the discourse of ‘alter-Asianism’ is and can be used to produce one’s own version to counter statist or mainstream forms of ‘orientalised Asianism’. The politics of bifurcation are likely to last for a long while, and these four books represent productive reflections on this uncertain transition to a dauntingly globalised Singaporean trajectory. Yew has written an account of Singapore Asianism which is rewarding to read and will be a reference work in the area for both scholars and students. This book is both a timely and a useful addition to the recent academic debates over Asianism. Yew has skillfully and clearly delineated his topic and made a valuable contribution to Asian cultural studies. The book is of use not only to specialists on Singapore but also to scholars studying the phenomenon of Asianism throughout the region. Leong uses specific examples to demonstrate the sensitisation of the official planning of regional consciousness on institutional projects, product branding, media representations and vernacular lifestyles. Leong goes on to show the process in which such conceptualisation of Asianism can be capitalised on as the new knowledge economy of education and popularised in television dramas.